Largest falcon of the region with wing-span of female Buzzard. Like Lanner in outline, but larger, and heavier-chested. Separated from Lanner by combination of whitish crown (sometimes confined to nape), unbarred Kestrel-like contrast above, less distinctly barred uppertail, poorly developed moustache and less contrasting head pattern (diffuse dark eye-stripe, no dark forehead-band); whitish supercilium often more conspicuous and belly more spotted, but lacks Lanner’s spot-bars on flanks. Juvenile almost identical to young Lanner. 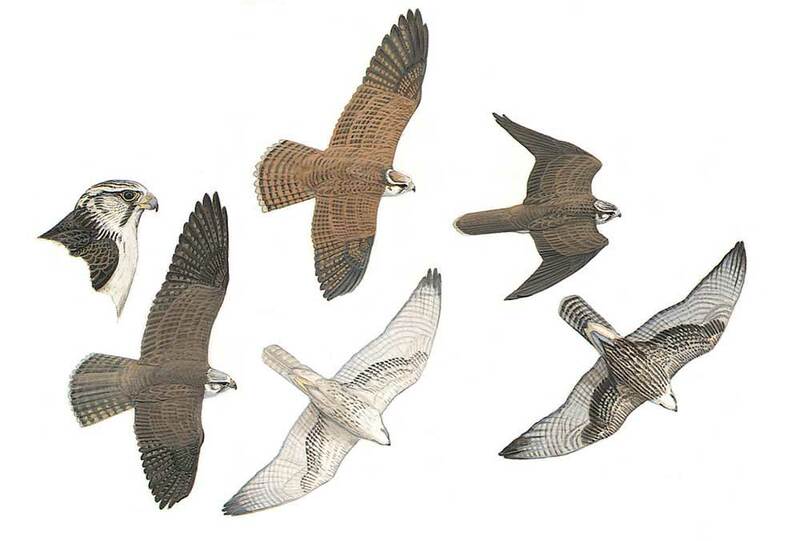 Flight with slow, flattish wing-beats; when soaring, wings flat or slightly up-curved.